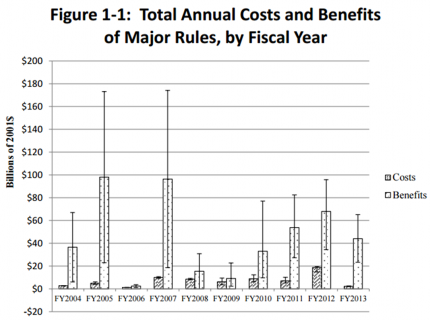 The Regulatory Right-to-Know Act calls for the Office of Management and Budget (OMB) to submit to the US Congress each year “an accounting statement and associated report” including: (A) an estimate of the total annual benefits and costs (including quantifiable and nonquantifiable effects) of Federal rules and paperwork; (B) an analysis of impacts of Federal regulation on State, local, and tribal government, small business, wages, and economic growth; and (C) recommendations for reform. By now, just about everyone accepts that carbon dioxide emissions from burning fossil fuels are warming our planet and changing our climate in harmful ways. With growing frequency we see headlines about extreme weather events such as heat waves, polar melting, severe drought, and violent storms—a dangerous mix whose costs for our economy and environment will only grow over time. Transitioning to a lower carbon economy is an essential step toward reducing these costs. The social cost of carbon (SCC) is a tool that helps Federal agencies decide which carbon-reducing regulatory approaches make the most sense—to know which come at too great a cost and which are a good deal for society. The SCC is a range of estimates, in dollars, of the long-term damage done by one ton of carbon emissions.